Saturday morning we woke up hungry and as usual didn’t know what to eat. Fighting off the urge to settle on a bowl of cereal I did a quick scan of the kitchen and decided. A Croque Madame would do nicely. 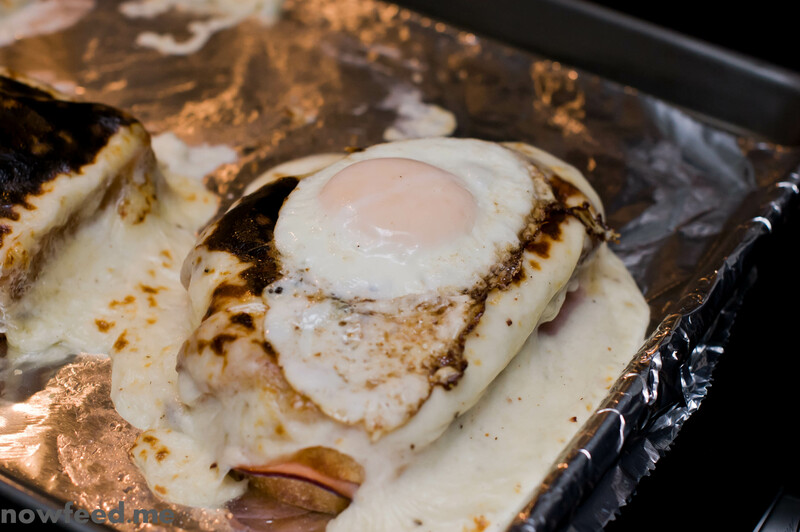 There are several variations of Croque Madame but the general idea is that you basically make a Croque Monsieur, add bechamel sauce, broil in the oven, and add a pan-fried sunny-side up egg on top. The way I make it varies a little every time I make it depending on what ingredients I have and what mood I’m in. It’s always good no matter how I end up making it. The picture above is one I made a while ago. I don’t really have an exact recipe but for the bechamel sauce for 4 Croque Madames I put about 2 tbsp of butter in a small sauce pan on medium heat. I then add a quarter cup of flour and stir it together until it forms a paste and keep stirring of and on for a couple of minutes until it browns a little. I then add a cup of milk, salt to taste, some pepper, and a small pinch of nutmeg. Stir often until it begins to thicken, then turn the heat to low and continue stirring often until it is thick enough to stick to a spoon. Take it off the heat when done. For the sandwiches I use whatever bread I have but prefer to use slices of a crusty French country bread, two slices per sandwich. You can cut one large slice in two if the slices are large as these are pretty filling. I heat a pan on medium-low, spread some butter on one side of the slices and toast them in the pan, not hard, toasted. The toasted sides will be the outside of the sandwich. When done take the bread out of the pan and spread some Dijon mustard on the untoasted side. Add a slice of natural ham, a slice of swiss cheese, and close the sandwich. Put the sandwich on an oven tray and repeat with as many sandwiches as you want to make. When the sandwiches are all on the tray spread bechamel sauce over each one letting it run down the sides, then place the tray in the oven on low broil. Put a little butter in the frying pan you used to toast the bread and fry one sunny side up egg per sandwich. When the sandwiches are done remove from the oven, place each sandwich on a plate, and place a sunny side up egg on top. Done! It sounds like a lot of work but once you have done it three or four times it takes less time to do as you get the groove down. I guess that you could also prepare the sandwiches the evening before, take them out in the morning, then just make the bechamel, spread over the sandwiches, pop them in the oven, and fry the eggs. 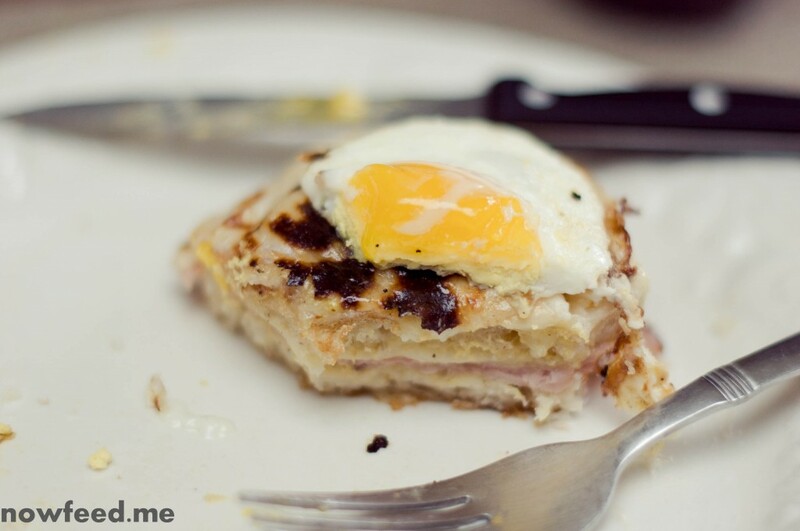 This entry was posted in Food and tagged breakfast, cheese, croque madame, egg, French. Bookmark the permalink.